There are bosos and bosons, and if the Large Hadron Collider (LHC) were built only to find the Higgs boson, you would be absolutely right to think all physicists belong to the first category. But the fact is, the LHC does much more than search for Higgs bosons. 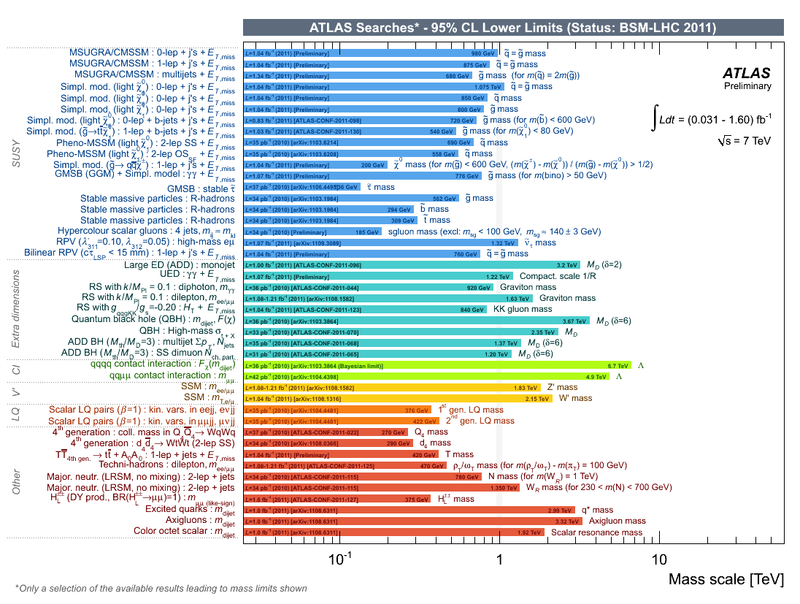 A selection of recent results obtained by the ATLAS experiment in search for new discoveries. In blue, searches for various supersymmetric models, in turquoise, models involving extra dimensions, and the other colors showing even more exotic models. But the LHC could be opening the door to parallel worlds, extra dimensions or the discovery of as many new particles as the ones we already know. These are but some of the exciting questions we are trying to address. By exploring the world of infinitely small particles, many of us hope to provide answers to the origin of our universe. The ALICE experiment aims to study the properties of quark-gluon plasma, a state of matter that existed only immediatly after the Big Bang. What happened just after the Big Bang? Why did matter overtake anti-matter when in a laboratory, they are created in equal amounts? Where is this asymmetry coming from? This is precisely what the LHCb experiment wants to elucidate. And it has already taken great strides in this direction. Finding out what dark matter is made of is certainly high on the LHC agenda. Dark matter was postulated in 1934 by Fritz Zwicky to explain why rotating galaxies don’t simply fly apart under the effect of centrifugal forces. Some unseen but huge quantities of matter seem to provide the necessary gravitational field needed to hold them together. It is hard to dismiss it since dark matter and dark energy account for about 95% of all matter in our universe! But this strange type of matter, unlike stars and galaxies, does not emit any light, hence its name. It only responds to gravitation, leaving much room for speculation on its nature. Many different hypotheses have been proposed to explain the nature of dark matter but so far, we have not succeeded in identifying particles associated with it. This mystery remains to be solved even though some experiments claim to have seen it, while others contradict these observations. Many of us, including myself, hope to get a glimpse at a parallel world called the Hidden Valley, a hypothetical world made of dark matter, with very few exchanges with our universe. Both ATLAS and CMS, being such versatile experiments, can look for many different types of dark matter candidates. One possibility is proposed within supersymmetry (or SUSY for short), a theory so popular, many think it could be the first one to be discovered with the LHC. SUSY is seen as the simplest extension one could make to the Standard Model to fill in a few holes left open in our current theory. As it stands, we have two categories of particles, the fermions and the bosons. The first ones are the building blocks of matter, the second are force carriers. These two sets of particles behave completely differently. Fermions have half units of spin (one basic property like the electric charge) whereas bosons either have spin 0, 1 or 2. SUSY associates a super partner to each particle such that each fermion would come with a “sfermion” (as in supersymmetric fermion) with integer spin associated to it. It is the same for the bosons. Heavier particles would be associated with light ones, and vice-versa. That way, everything would seem much more balanced, getting rid of the puzzling differences among all the elementary particles, ranging from ultra light to super heavy. Supersymmetry has everything to be successful except that it has not manifested itself yet, despite all our attempts at unveiling it. What would you say if you found out we do not live in a four-dimensional world, (three dimensions of space and one of time) but rather one containing extra hidden dimensions? This is at least what some theorists suggested, predicting that these dimensions are so small that they are not readily available to us. To visualize this, imagine you are a tightrope walker. To you, only one-dimension is accessible: you can move forward or backward. But for an insect walking on the same taut cable, it is also possible to go around the cable, giving it access to an additional dimension that is inaccessible to you. Why should we need this? Extra dimensions would explain why gravitation is so weak. We physicists have long pondered over the huge discrepancy between, say, the electromagnetic force and gravitational force: 41 orders of magnitude at the scale of the nucleus! Just think how much stronger a small fridge magnet is compared to gravitation. Bring it close enough to the fridge and the magnet can overcome the gravitational attraction of a whole planet! If extra dimensions exist, they would provide a place where most of the strength of the gravitational force could be leaking to, leaving only a small fraction of it for us to feel on the macroscopic scale. Who needs science fiction when we have particle physics? Enough strange puzzling questions and even stranger possible answers to blow your mind!